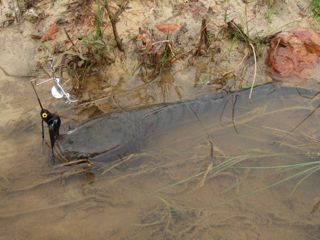 Also known as the Snakehead, or Sang Yee, the Haruan is probably the most fished for predatory fish in our fresh waters near the cities and large towns.The reason for its popularity is its ability to survive in any little puddle, ditches by the road side, old mining ponds, slow moving streams, paddy fields and swamps. This ensures haruan can be found almost any where water is found. Its ability to survive in minimal water is due to the presence of a accessory respiratory apparatus. In other words, they breathe air. In fact they will "drown" if prevented from breathing. They have been found to "walk" from one body of water to another by lateral undulations of its body. Every weekend you'll find haruan fishermen fishing all sorts of puddles by the roadsides. Surprisingly to the non-haruan fisher-person, haruan up too 2-3kgs are sometimes pulled out in these little "puddles"! Other favourite places are old mining ponds and swampy places. The favourite local bait are frogs. One tackle shop owner told me he used to sell 10,000 frogs a week! Rigged up weedless and cast towards the haruan's lair will often result in an aggressive take. Another productive method is lures: soft plastic lures fished weedless for snaggy areas, spinner baits, spoons, spinners and plugs. Fly fishing catches haruan too! Flies that imitate baitfish, like deceivers, clousers, poppers and dahlberg divers have been found to be successful. Anything that will trigger the haruans predatory instinct works! The haruan will hang out near structure, be it dead branches or a clump of weeds. In fact if there is more weed than water, chances are there'll be haruan deep among the grass. Therefore most haruan fishing is done with frogs, that can be cast into these holes among the weeds and slowly twitched along. Sometimes the take can be a vicious strike. At other times it could be a gentle tap. One should slowly release the line, letting the haruan swim away till a fine trail of bubbles is seen. Then set the hook. This will ensure that the whole frog is swallowed, allowing the buried hook to find a grip within the haruans mouth. 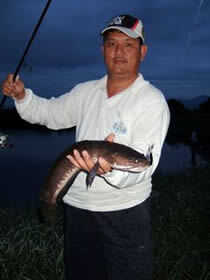 If artificial lures are used the hooks should be set immediately before the haruan drops the lure. They can be caught as big as a kilo in heavily fished waters, but in untouched places sizes of 2-3 kilos is normal with haruan as big as 7 kilo caught occasionally! One could equate this fish to the American Large mouth bass in popularity with the average angler. We need to protect and conserve our resources by practising catch and release of our sportfish and protecting the habitat of our fishes. Contributions in the form of pictures and articles are more than welcome.